The winners of the Relax and Enjoy contest (chosen randomly from over 400 entrants) are Victoria Hyde (who declared her love of Carmel is due to it’s various forms and textures) and Masa Soliman (who claimed that caramel is "gooey and delicious and tastes good in everything — chocolate, ice cream, creme caramel, cookies, YOU NAME IT). Thank you to everyone who entered. My email inbox is very tired and grateful that this contest is now closed. There are few sweet combinations that I like more than caramel and chocolate. Actually, to be completely honest, chocolate does go with just about anything. But caramel, with it’s slow, subtle flavour and it’s deliberate texture, it is probably the ideal companion. The chocolate stains your fingers and the caramel lingers right alongside for serious licking enjoyment, long after the actual confection is gone. Dessert doesn’t get much better than that. Caramel is one of those concoctions that make you slow down and take your time. Chocolate is dreamy and delicious and studies show that it actually does make you happier and more content. 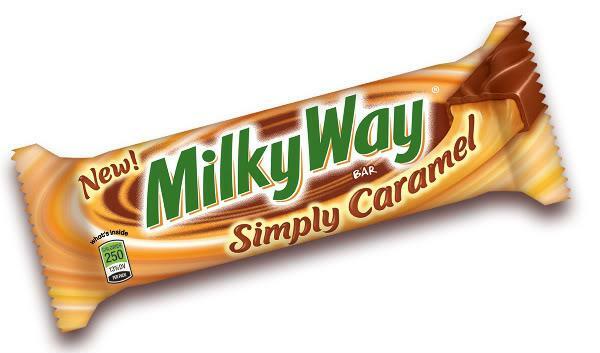 And now, thanks to Milky Way we can have our chocolate and our caramel too – with their new "Simply Caramel" bars. And, thanks to the good people of the Milky Way brand, I have an amazing prize pack for two lucky winners. The "Simply Caramel Relax and Enjoy" gift packs each contain the a $75 gift certificate to SpaFinder.com (for a yoga class or a massage) and enough Simply Caramel Bars to indulge in for a month (that’s five, according to the chocolate bar professionals). I know my ideal prize is getting a massage WHILE eating all five of the chocolate bars in one afternoon though, and you are welcome to do that if you wish (just don’t tell anyone!). So, if you’d like to win one of these prize packs, all you have to do is email me with why you love caramel. All entries must be received by 12 noon on Friday August 20th. The winner (randomly selected) will be announced here before 4pm that same day.